Carly' last visit was a significant visit because it's the visit we have been looking forward to the second most. The first being the initial visit to begin CBD Oil treatment. We have been looking forward to this visit because we started to wean her off of other AED(Anti-epileptic drugs) she has been taking. Remember, she has been taking AEDs a majority of her lifetime so this is a very big deal for her and us as parents. We decided to start weaning the Vimpat first. Vimpat was a logical choice since her levels were low anyway and the chances of an adverse reaction were lower. Vimpat is the drug that is indicated and approved for the use of people 17 years of age or older. (source: www.vimpat.com) Carly is 4. Though Vimpat is in clinical trials for children it is still not FDA approved for children under 17. This was the BIG eye opener when I first read about Vimpat. How can this drug, which can lead to abuse and dependence (source: www.vimpat.com), be given to my then 3 year old daughter. She has been taking Vimpat for over a year. This lead to and continues to be my contention with those against CBD treatment. No, it's not FDA approved, however, neither is giving Vimpat to a 4 year old. As with anything else if the doctor thinks the risk/benefit ratio is in the favor of the patient they should be able to use CBD regardless of persons condition. Dr's are using Vimpat in this same manner. This is what I call a double standard. Can someone explain why it is okay to give a 4 year old Vimpat when the company itself, UCB, says it is only approved for people 17 or older? One argument against Doctors administering CBD to patients is the dr's don't know how to do it nor do they know what might occur. Well, did they know what would happen to Carly when given Vimpat? The answer is pretty clear. No. So far the wean has been wonderful. No side effects that we can tell. She will be weaned completely off of in just two weeks and we will have another Dr's appointment two weeks after that. We haven't decided which AED will be next. Each decision is very tough because we never know what the result will be weaning an AED. If you are wondering, Carly is doing great other than her ear infections. She has had another ear infection which makes 4 since May. We believe it's time for tubes to be put in her ears. Her ENT and Pediatrician agree. That will be in the upcoming weeks. Her cognitive ability is still improved and seizure control is still in place. 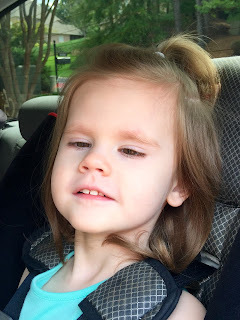 No "big" seizures and her myoclonic's are minimal, if any. **On a side note, there are children&adults not seeing improvement with CBD. Results will vary patient to patient. I believe drug interactions have played a major role in adverse reactions to CBD, not the CBD itself. I'm glad to hear Carly is responding so well to the CBD oil. I only hope that my daughter Kaitlyn responds half as well when she starts the double blind CBD Study at Children's of Alabama on September 25th. It is very encouraging to see Carlys results . Hi Rob, Thanks for the comment and kind words. I pray that Kaitlyn will respond well. I know there are some children that are responding well and some that are not. The ones that aren't is usually because of drug interactions not the oil itself. I will be thinking about and praying for your daughter. Bye-Bye Vimpat - One Down, Two to Go!